In SQL Server, while working with the large data sets (or huge records), we might require to store the intermediate results in temporary query. So that we can access them further. SQL Server provides multiple options to achieve the same: CTE, Temporary Tables, Derived tables, and Table Variables. 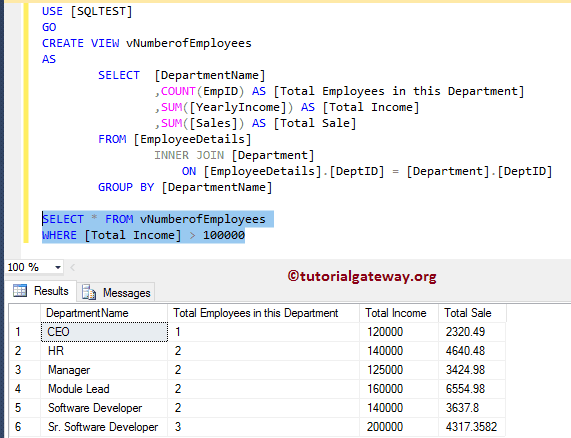 In this article we will show you the Difference between CTE, Temp Tables, Derived tables and Table variables in SQL Server with practical examples. 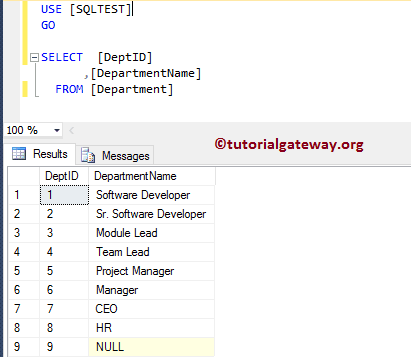 For this, We are going to use two tables (Employee Details and Department) present in our [SQL Test] Database. We are going to use Inner Join to get column from both Employees and Department tables. And, we use GROUP BY Clause to aggregate the columns. I suggest you to refer Aggregate Functions article. Last we use CTE, Table variable, Temporary Tables, Derived tables to filter the data. We are going to achieve our object using the Derived Column. 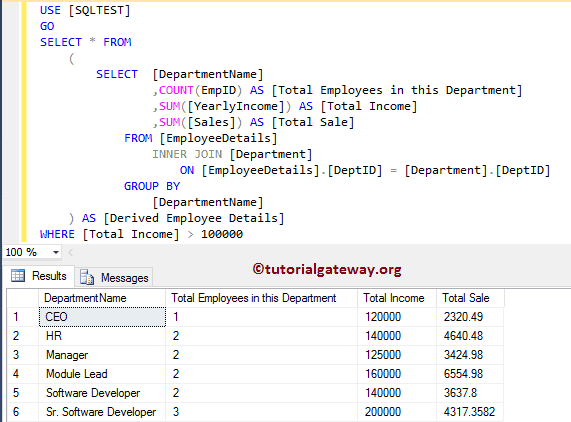 I suggest you to refer SQL Derived Table article to understand the query. We are going to achieve our object using the Temporary table. First we are using the Insert Into Statement to insert records into Local Temporary Table. Next, we are selecting all the records from that temporary table whose Total Income is greater than 100000. 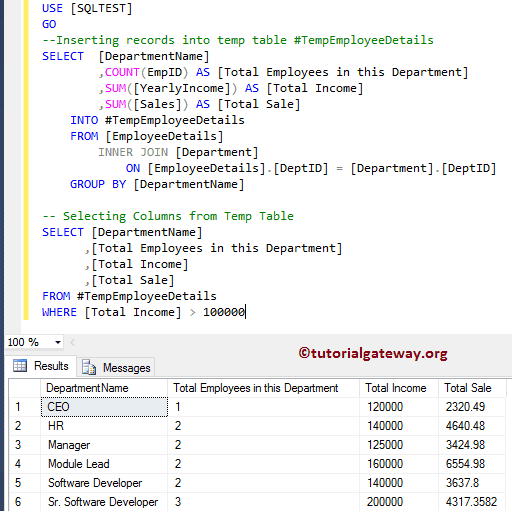 I suggest you to refer SQL Temp Table article to understand the query. 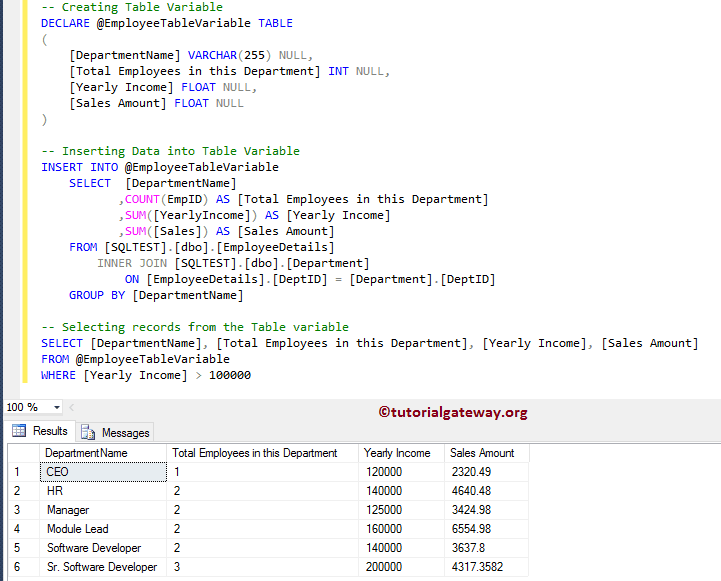 This time we are going to use Table variable to achieve our object. First we declared a Table Variable, next we are using the Insert Into Statement to insert records into that Table variable. Lastly, we are selecting all the records from Table Variable whose Total Income is greater than 100000. 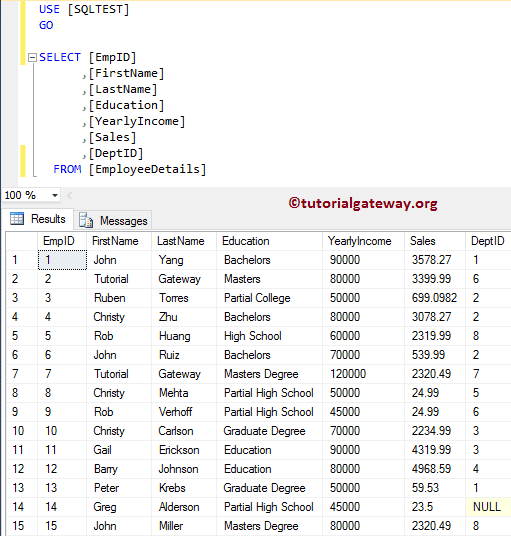 I suggest you to refer SQL Table Variable article to understand the query. This time we are going to use Common table expression (or CTE) to achieve our object. First we create a CTE. Next, we are selecting all the records from that CTE whose Total Income is greater than 100000. 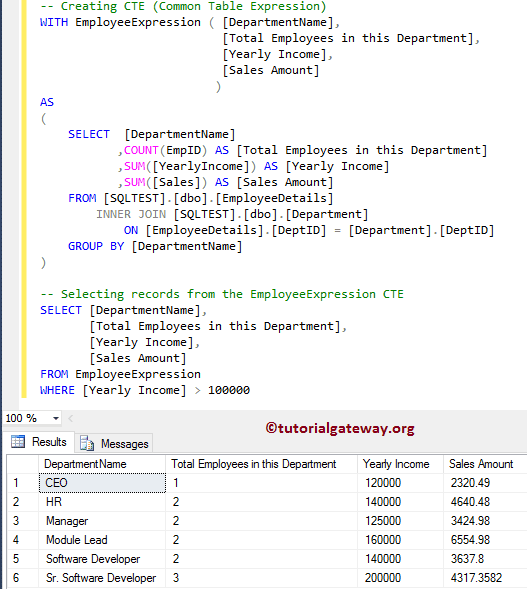 I suggest you to refer SQL Server CTE article to understand the query. You can also use Views to achieve our object. First, we create a view that is selecting all the matching records from both the tables along with aggregations. Next, we are selecting all the records from View whose Total Income is greater than 100000. I suggest you to refer SQL View article to understand the query.